Have you ever had any of the following questions? "How do I know if what I'm teaching the kids is correct?" "I've just decided to be a head coach. Where do I begin?" "How do I train my lesser-skilled players while keeping my advanced players engaged?" "I have so many questions about coaching youth baseball. Where can I find answers from a trusted source?" "No one wants to talk about strategy...it's as if it's top secret. Does anybody want to help coaches improve their strategy?" 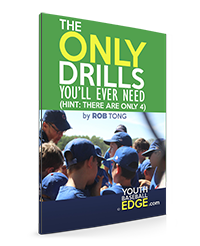 "What drills will actually help and what drills are a waste of time?" If you have asked any of these (or some similar variation of these), you're in the right place. What is Youth Baseball Edge? Youth Baseball Edge is complete player & team development based on practical, actionable content. In the past, coaches who only taught the fundamentals were the gold standard. Unfortunately, those days are long gone. Today, coaches who only teach the fundamentals of baseball are—ironically—not good enough. Don't get me wrong. Teaching the fundamentals is still a requirement of a good coach. But sometimes the fundamentals being taught turn out to be fraudulent fundamentals (squish the bug, anyone?). Furthermore, even teaching the proper fundamentals—if that's all the coach teaches—is inadequate. I believe successful youth baseball coaches must also become master strategists, psychologists, motivational speakers and character builders. It's this holistic approach to teaching youth baseball that makes Youth Baseball Edge different. Nearly everywhere else, the focus is on drills, drills and more drills. But teaching baseball is not just about drills. As mentioned, youth baseball is not just about the physical. So teaching youth baseball must go beyond mere drills. It requires complete player and team development in areas beyond just the physical—as important as the physical is. There's just one nagging problem, though. How can you find the time to research how to do all this while working a full-time job—or running a business—and raising your family? You could choose to spend time pouring over countless books, watching hundreds of videos, and wasting time reading outdated information online...or, you can subscribe to the Youth Baseball Edge newsletter (it's free). Get a holistic understanding of player and team development. Give yourself the full picture when you subscribe to the free Youth Baseball Edge newsletter. 100% spam-free. Unsubscribe any time. I'm now a father of seven (including five boys!) in the great city of Chicago, but this journey started when my wife and I signed up our first boy to play baseball when he turned five. At the time, I had never coached anything in my life but I had heard enough negative stories about lunatic coaches that I decided to be my son's head coach so I could control the culture of his team and ensure he would not have to endure the wrath of a maniacal coach. Perhaps a similar impetus drove you to be a youth baseball head coach yourself. That day I committed to be a head coach was actually one of the scariest days of my life because I knew I had never coached before in any sport at any level. Failure stared me in the face. Sure, I had played baseball as a teenager before and had watched countless Cubs games on WGN-TV to know some of the nuances of the game from the color commentators. But how would I translate that in a way that the kids on my team could understand? Panic was an accurate word to describe at that point. I went to the library and read as many books and watched as many videos as I could...which wasn't much. I think it was all of two books and one VHS video at the time. They were, though, quite helpful in instilling the notion of using drills, and giving me the exact drills to run. I also went to a coaching clinic sponsored by my league, which gave me an idea of how to organize my practices. Panic subsided and I actually felt somewhat ready. That first year produced fairly noteworthy results. Our tee-ball team performed strongly, despite my on-the-job training. Yet despite the positive accomplishments, I still felt a gnawing feeling that I could do better. I continued to read and research every single offseason, devouring every resource I could possibly find and evaluating the merits of each. After all, there is so much misinformation out there in the youth baseball world that you could make your team worse. Furthermore, I discovered that there is so much more to being a successful youth baseball coach than merely teaching the fundamentals (as important as those are). Even now, 10 years later, I know I still have so much more to learn as I'm trying to figure out what information is valuable and what is fraudulent. With my youngest son being just one year old, I've got another 20 years left to coach...so I've got a vested interest in continuing to improve my coaching. And as I pass along everything I know and learn, you get the benefit of learning along with me—but without having to devote the massive hours necessary to do the proper research that I'll already be doing for you. And as you improve in your own coaching, your kids get the benefit. And as multitudes of kids benefit, the game of baseball itself thrives as coaches like you nurture a love of the game in the next generation. 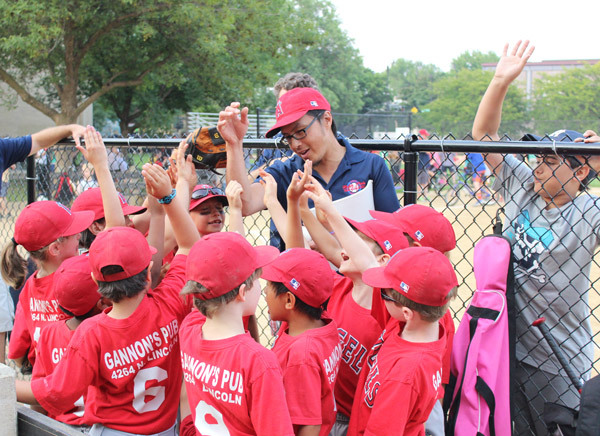 So Youth Baseball Edge helps make it a win-win-win for everybody. Through the podcasts and the blog, YBE's dual-pronged approach to teaching complete player and team development is another reason Youth Baseball Edge is unique. Meanwhile, the blog will showcase issues you won't find in the podcasts. Some of the blog posts will be my lessons learned from both my own failures and my successes, as well as other things I've learned while doing all my research. Additionally, you'll find free, exclusive resources on the blog that you can download, print and take with you on the field if you think they will help you. Taking both the podcasts and the blog together, Youth Baseball Edge will be a comprehensive, powerhouse resource to further our complete understanding of the youth baseball game. Best of all, YBE will sift through all the noise so you don't have to. My goal is to give you only the best practical, actionable content. Step up your coaching game. Subscribe to get in the know...and get the Edge.